Last year when Kevin got me my beautiful new Cannondale bike it took a little getting used to – the whole feel of the bike was completely different. I never would have thought – I mean a bike is just a frame with 2 wheels and pedals right? I know that there are different bikes for different things – road bike, mountain bike, hybrid… I went from a Diamondback hybrid to a Cannondale hybrid – It’s hard to explain, maybe I was just trying to be super careful and not wanting anything to happen to it as my new bike was more expensive than what my current car is worth (my car is super old and according to the Kelly Blue Book value my car truly is a little less, but it’s like a tank and I love it dearly and can not bring myself to part with it yet – LOL) but also it just FELT totally different. It has hydraulic disc brakes, slightly thinner tires (even though they are both considered hybrids) and thumb shifters – which I LOVE – they are sooo smooth compared to my old bike which had the twist grip shifters. It is also incredibly lighter than my old bike. I think I was just so used to the my clunky old bike that it took a lot to get used to how smooth the new one was. But the BIGGEST difference I didn’t even notice until I was riding home from work earlier this year – I decided to swing by a gas station to fill up the tires with air (I got the bike for Christmas so I hadn’t been riding it much til spring.) 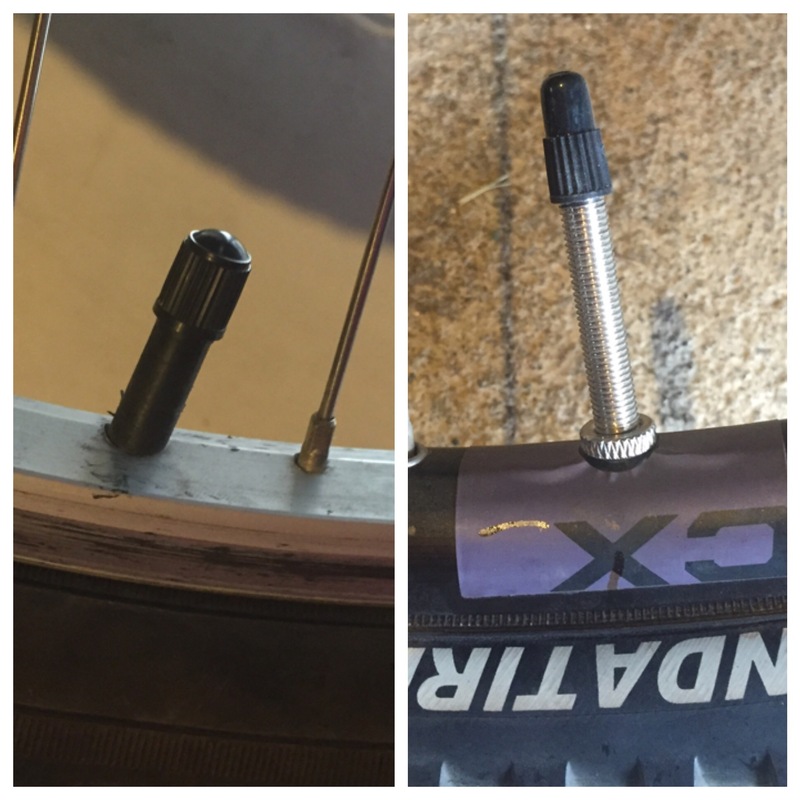 I rode up to the air pump, jumped off my bike and started to unscrew the cap and noticed it was a WAYY thinner valve than my old bike – what was going on? Once the black dust cap was off I had no idea what I was looking at – was this some kind of defect? I didn’t even see anything that looked like a hole where the air would go into – just a weird little nubbin! I stood there just staring at it – there was NO WAY I would be able to fill up my tires – that dinky little bike valve would never attach to the air pump. I rode home totally confused. So how on EARTH do you fill these tires up with air?? I found some videos on YouTube. After taking the dust cap off, you have to unscrew that weird little nubbin to OPEN the valve, then tap on it to release a bit of air. Turns out you can either get an adaptor that screws on which makes it compatible with the standard air pumps (like the ones I was used to at a gas station) OR I can get a hand pump and change out the end to make it compatible with the Presta valve. I got both. Another thing I learned is that my bike didn’t come with lock nuts so when I went to fill my tire for the first time, I actually pressed too hard and punched a hole in the tube — grr!! So frustrating! When I took my bike to the bike shop for a tune up, they replaced the tube for me and put a lock nut on, but only on 1 tire. You can see in the picture below, the old tire doesn’t have the threads for a lock nut so I’ll have to wait til that goes bad to get one – no reason to waste a tire! 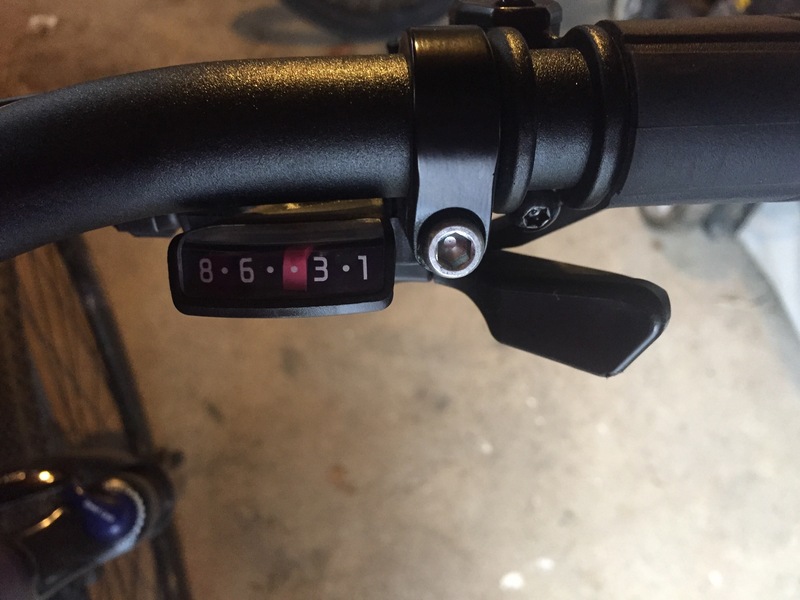 This post makes you look like a bike noob you know. 8>) Whatever. Welcome to the bicycling world. Your in for a hell of a ride over the years. You will adjust to the presta valves in time. I too was skeptical about them but again, that was in 1998. Those of us who are old timers in the bike world don’t usually replace our bikes. We add to the stable. As a matter of fact, my 5th bike should be arriving any day now. I gave away two over the summer and sold one. The two were for parts and I used them up, so I really gave away two frames. N+1 is a term you now have in your vocabulary where N is the number of bikes you have and N+1 is the number of bikes you want. I remember my first time seeing presta valves too. What in the world?? And why? Now, several years later, I even have a presta valve tube on my BOB trailer! I went through a similar learning curve this spring when I got my road bike, it is funny how a simple valve can be so confusing at first! I would have been looking this thing up online – totally bewildering to me! Then again, despite owning three bikes, I am most definitely not a bike person (one is my bike I had as a kid, one is my ten speed (still my fave!) and one is my fancy bike. I have no idea what its best use is. I use it on rails to trails type paths). BEAUUUTIFUL bike, I will have to remember this when I need air for my tires! 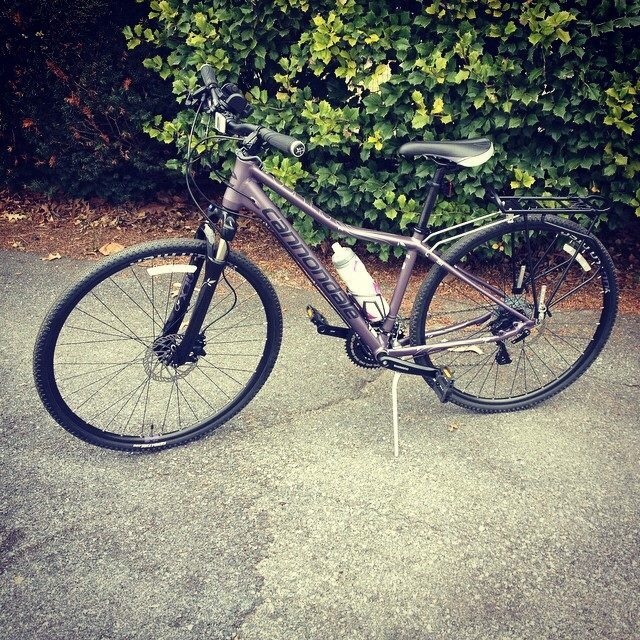 I have a Cannondale too, and am now curious if my tires are similar.